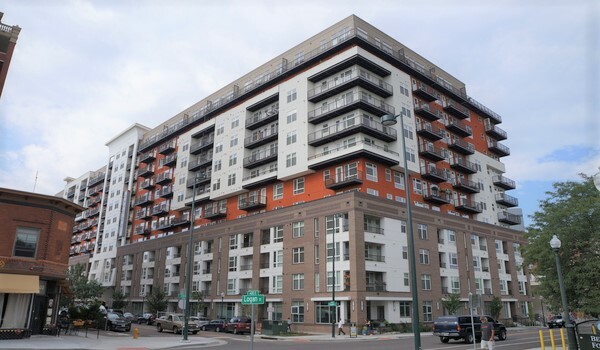 One of the nation’s largest owners of apartment units has re-entered the Denver market after less than three years away with a $134.97 million buy in Uptown. Chicago-based real estate investment trust Equity Residential purchased the 12-story Alexan Uptown complex at 1935 Logan St. on Tuesday, according to county records. The property was sold by Trammell Crow Residential, which completed the 372-unit project last September, according to the company’s website. As of Thursday morning, Equity Residential had updated its online portfolio to include the Logan Street property and indicated that the complex is being renamed Radius Uptown. The portfolio does not include any other Denver properties. According to the complex’s website, studios start at $1,523 a month, while one- and two-bedrooms start at $1,738 and $2,703, respectively. As of the end of June, Equity Residential owned or was invested in 304 properties with 78,645 apartment units, according to an earnings report. The properties primarily are located in Boston, New York, Washington D.C., Seattle, San Francisco and Southern California. Only Memphis-based Mid-America Apartment Communities and Greenwich, Connecticut-based Starwood Capital Group own more apartment units than Equity Residential, according to the National Multifamily Housing Council. Equity Residential is familiar with Denver, but hasn’t had any holdings in the Mile High City since January 2016, when the firm sold 18 apartment complexes in Colorado to Starwood for $1.37 billion as part of a larger $5.3 billion deal.